Handicap shower ramps can significantly improve the life of handicap persons. From the increased independence to added safety, this type of ramp makes it possible. Handicap shower ramps provide a solution to maintaining independence by allowing the user to gain access to the shower much more easily. The shower commode and shower wheelchair users can roll into these showers independently. Those without amenities such as this, may often find, that utilizing their own shower can be next to impossible. This is why a handicap shower ramp can be so beneficial to these individuals. Below, you can see a ramp for shower curbs that is perfectly designed for wet conditions and is compact enough to be useful without being obtrusive. It is made out of hard plastic and able to support heavy weights without cracking. There is also drain holes to let the water flow through and this prevents the pooling of water on the shower ramps. Most showers designed for the handicap will require some type of barrier to prevent water from spilling into the bathroom floor. However, these barriers can make it difficult for someone with a wheelchair to get into or out of the shower. Handicap ramps allow the individual to safely and efficiently cross this type of water barrier without the hassle. When creating wheelchair accessible showers, different entryway configurations are available. Here are the most common solutions for wheelchair accessibility. Floor level shower (no curb) – The entrance way to these shower floors are level to the ground and then sink slightly for drainage. They are completely barrier free but water can flow freely at an angle into the drain. Shower with water retainer – Water retainers are typically rubber and collapsible when a wheelchair tires are rolled over it. They will return back to their original shape once the weight is off. These retainers are used in conjunction with flat shower floors and keep the water from spreading. 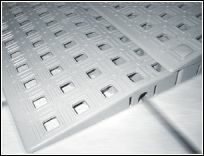 Shower Ramps with 1/2 inch curb – These 1/2 curbs are the standard for roll in handicap showers. They are low enough for wheelchair users to roll into the showers but high enough to prevent water from leaking out. These low shower curbs are best for someone who has no trouble with maneuvering their wheelchair. 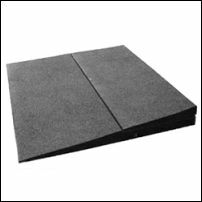 Shower Ramps ADA Regulations – To solve the problem of higher curbs, shower ramps can be installed. These ramps are typically plastic, rust proof and have holes for drainage. They meet the ADA minimum requirements for ramps, 12 inch length for every 1 inch of rise. Stepless ramps systems, one type of shower ramp, are easy to install by stacking on smaller ramps to build the required height necessary. There are numerous advantages to utilizing a handicap ramp. Not only does equipment such as this promote safety, but allows the wheelchair bound person to have the same pleasures of those who are not in a wheelchair. This ramp can mean the difference of having to rely on someone else or having the ability to do for one’s self. Expect to pay out of pocket for shower ramps because Medicare does not pay for them. Your private insurance may cover certain ramps but make sure to acquire medical necessity documentation from your physician beforehand. Out of pocket costs could range from $60 to $350 and up. In comparison to other options, a handicap shower ramp is typically more affordable and assists the user to navigate their home a little better.